Schools in Maharashtra are uneasy executing the Regulations Act for School Buses issued by the Government under the Maharashtra Motor Vehicles (Regulations for School Buses) Act 2011. School authorities are apprehensive about facing several obstacles like finding the right bus operatives, listing information about pupils and above all convincing the parents. 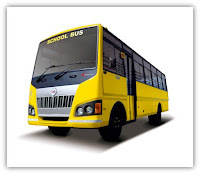 Although several school authorities have discussed the school bus safety policy, they are still confused about its implementation, as the additional fee is of concern to most of the parents. They have tried to persuade parents to opt for the school bus, a safer option as compared to overcrowded BEST buses and autos. A lot of money is spent on private vans as well, the safety of which is often questionable. Parents must pay closer attention to these problems. Issues of safety and security concerning their children must be given paramount importance. The Government’s decision to issue the school bus safety policy has certainly been a positive step ahead. Some schools, however, are criticizing the Government for the burdensome process of gathering data and completing the student documents prior to the start of the academic year. Schools are finding it time-consuming and taxing to accumulate all information about the students, especially since getting in touch with them is tough during vacations. Nonetheless they are finding proper bus operators that obey to all the rules prescribed by the Government.